Officially Emirates will launch daily non-stop Dubai-New York flights with its new A380 super jumbos on October 1 (see online news January 17). But in a surprise move the Gulf airline has decided to showcase its first A380 by operating special flights to New York on two days: August 1 and August 3. Bookings can now be made on the airline’s website. On August 1 special A380 flight EK3801 will depart Dubai at 1100 arriving into JFK the same day at 1645. Return flight EK3802 will depart at 2100 to land in Dubai at 1745 the following day. Another special A380 flight EK3803 will operate on a one-way basis on August 3 using the same timings as EK3801. Flights will operate in a three-class first, business and economy layout. Full details of the on-board layout and facilities will be announced on July 28 when the first A380 is handed over by Airbus at a ceremony in Hamburg. Between the end of July and March 2009, Emirates will take delivery of five A380s which, after New York, will begin to appear on routes linking Dubai with London Heathrow, Sydney and Auckland. All told, Emirates has purchased 58 A380s at a list price of US$18.8 billion which is by far the largest order by any airline. For more details go to emirates.com. 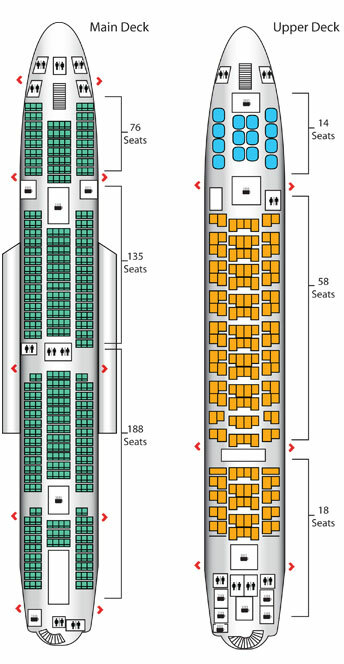 Click here to compare this seating plan with the Singapore Airlines A380 configuration.